We have come a long way from days when bathrooms were gloomy cramped spaces to bathe quickly and get ready for the day. Now they are sanctuaries for exhausted souls who want to wash away their worries in style! 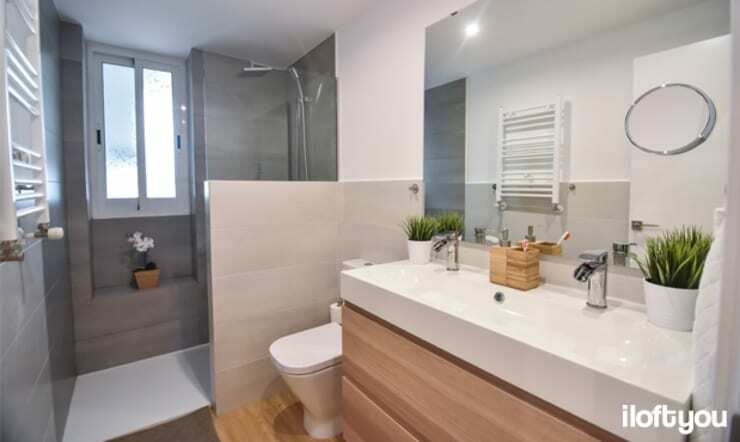 Modern bathrooms are increasingly becoming aesthetic and very comfortable spaces where you can take a long hot bath or refreshing shower to replenish your energy and motivation. So, whether you are designing a new bathroom or renovating an old one, these 11 creations here can inspire you in countless ways. 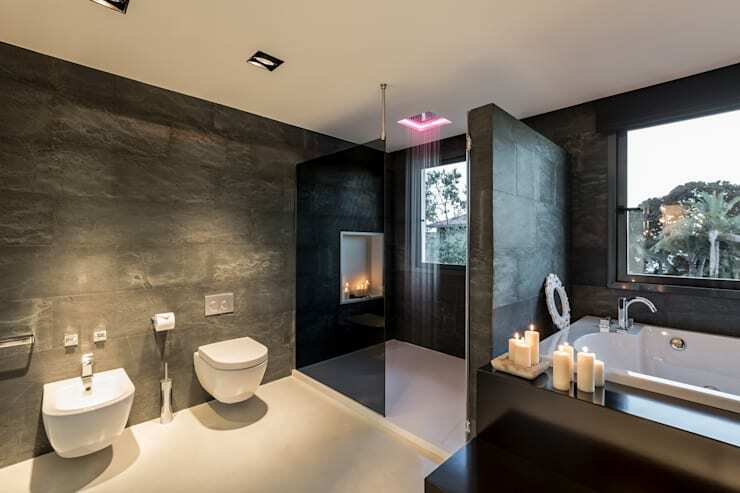 Take cues from their designs, materials, colours and lighting to make your own bathroom wonderful. The interior architects at Kabaz have designed this narrow bathroom in a very creative manner so that it looks luxurious. Clever use of glass and mirror along with windows gives this space an expansive, bright and airy look. Mosaic wall cladding lends extra elegance to the shower area and washbasin, while niches above the sink help in organising towels and toiletries. 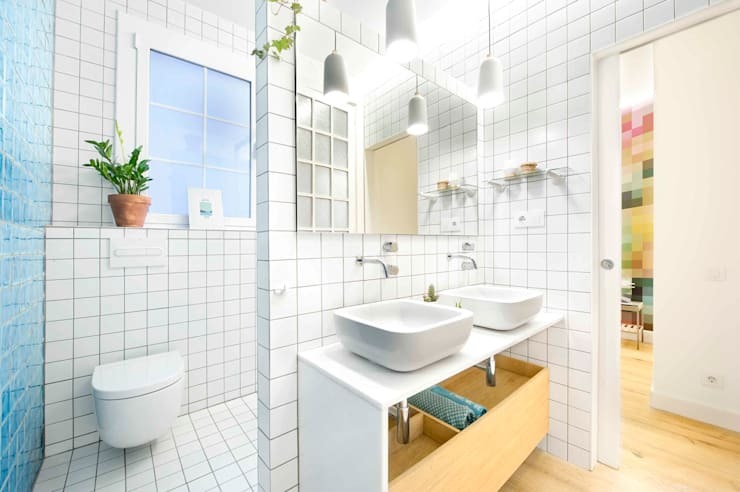 Soothing hues like white, light grey and light-hued wood make this small bathroom appear spacious and bright. 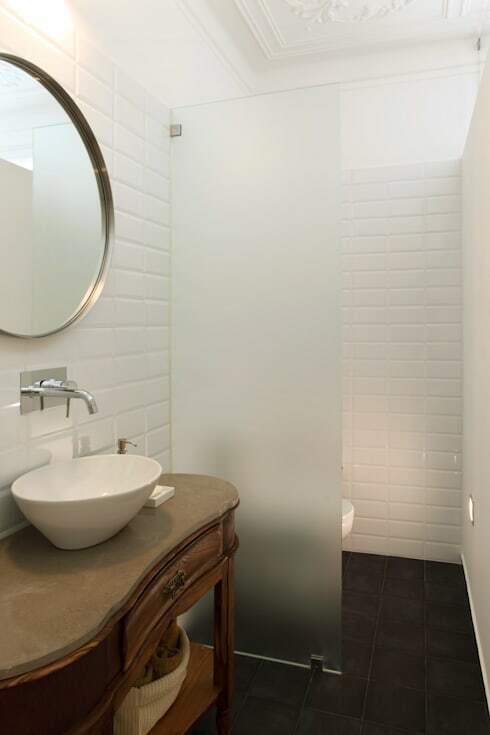 The large mirror helps too, while the half wall between the shower and WC ensure privacy. Pretty potted greens lend a refreshing touch. If you are someone who prefers showers to baths, then a large walk-in shower can cater to your needs comfortably. They are cheaper and more sensible than baths as well. 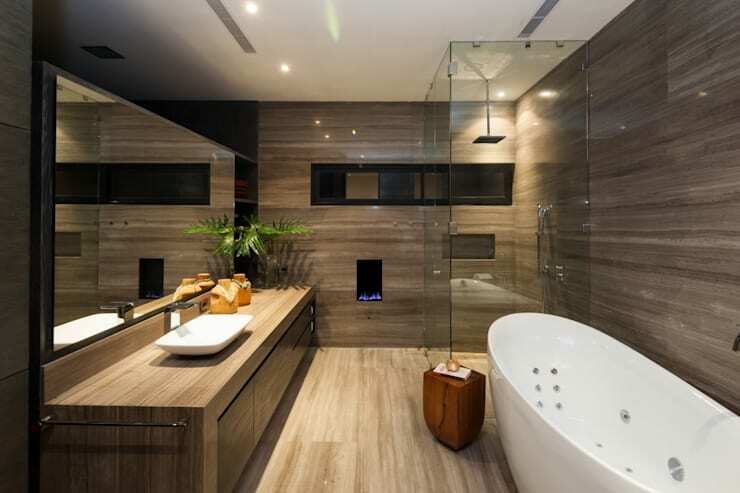 Generous use of wood in the form of cladding for the floor and walls can make a bathroom very cosy and warm, as shown here. It must be treated though, to prevent moisture from seeping in. Sometimes, it is not necessary to overtly accessorise bathrooms to enhance their beauty. You can simply bring in some beautiful candles to make the bathing experience magical and romantic. The pink indirect lighting in the shower is also stunning. 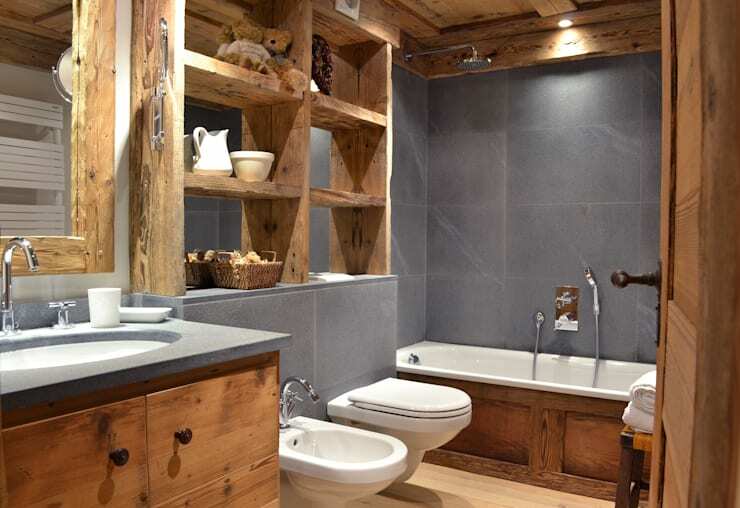 Untreated natural wood lends oodles of rustic charm and earthiness to this bathroom. Its rugged and original appearance beautifully contrasts the smooth walls and modern sanitary fixtures. This sparkling white and bright bathroom is a blend of spotless tiles, modern sanitary wares, a large mirror and powerful lights. Potted greens add a dash of freshness here. An undoubtedly antique wooden sink unit lends a whole lot of character to this otherwise modern bathroom. 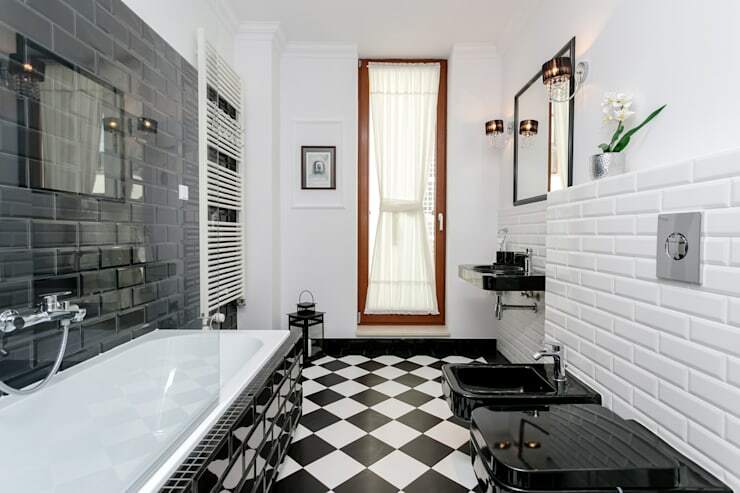 The neat white railway tiles on the walls, the mirror, the trendy fixtures and the frosted glass partition all look special against this vintage piece. 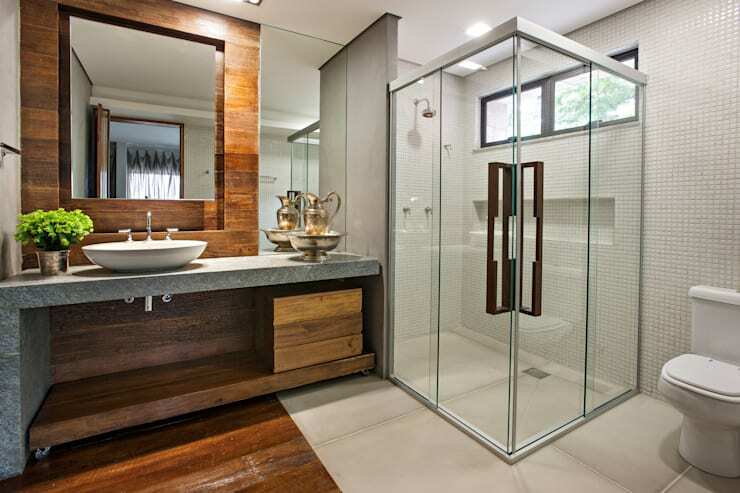 Chessboard flooring can make your bathroom look elegant, luxurious and timeless. The walls are clad with glossy black and white railway tiles to complement the floor, and the sanitary fixtures follow the same rule too. Rendered in white and grey, this spacious bathroom mimics what you usually find in lavish hotels. 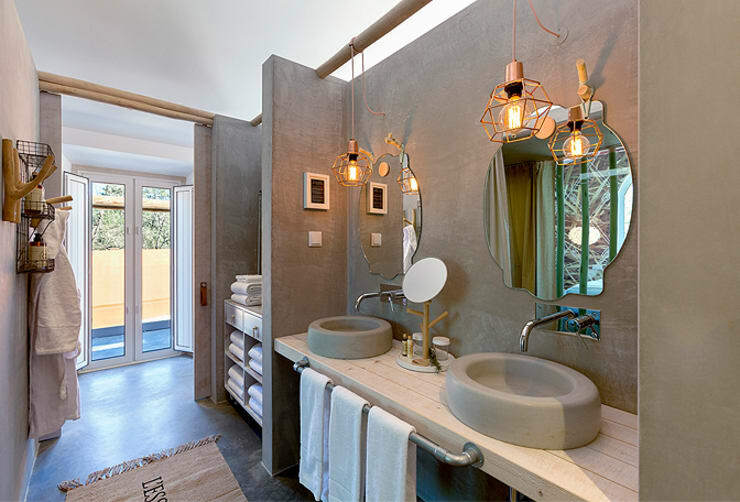 Two unique mirrors, two stylish sinks, fashionable golden lamps and neatly organised towels make this space extremely attractive. The wall on the left features steel racks for toiletries and hooks for bathrobes. Neat and stylish sanitary fixtures, simple lines, calm white and grey tones and lavish use of glass and mirror make this bathroom dreamy and happy. 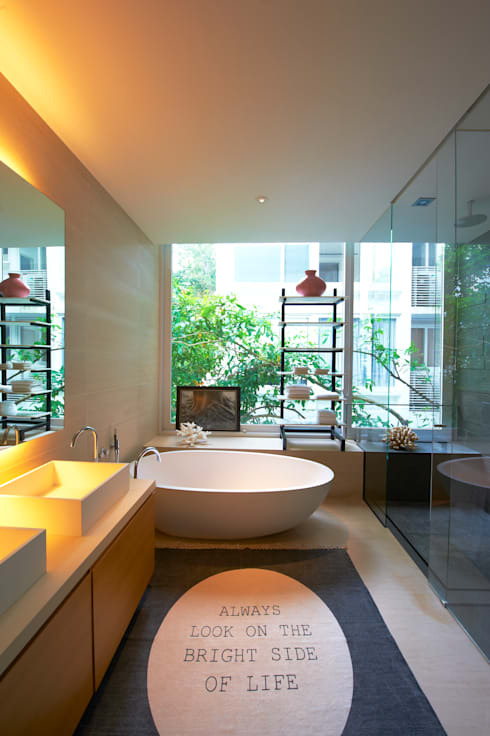 The curvy tub gets flooded with sunlight, while golden indirect lighting livens up the sinks. The rug with its positive message cannot be missed!